Always expecting black helicopters above you? Waiting for a task force to knock on your door? 8 Locks on your door? 32 character passwords? Allready using 4096-bit keys? Then you will need the HARD DISK BREAKER 200P in addition to that physical security system that turns the door frame into a giant electromagnet. 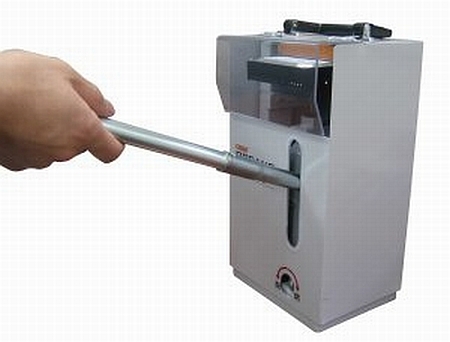 HARD DISK BREAKER 200P prevents theft of hard disk data by physically puncturing the HDD. A camera inside the unit displays the destroying process either by still or motion picture.